Behind your walls and beneath your floors there is an intricate network of water supply lines, drains and vents that make up your plumbing system. 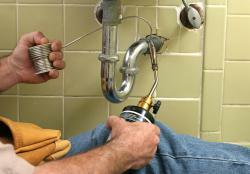 Sometimes your home or office drains clog, or your plumbing pipes leak, freeze or burst, requiring repair or maintenance. Your water supply pipes may have problems that limit water pressure, impacting everything from the quality of your shower and the flush of your toilet to the reach of your lawn sprinkler. ©2019 Adams Plumbing, all rights reserved.